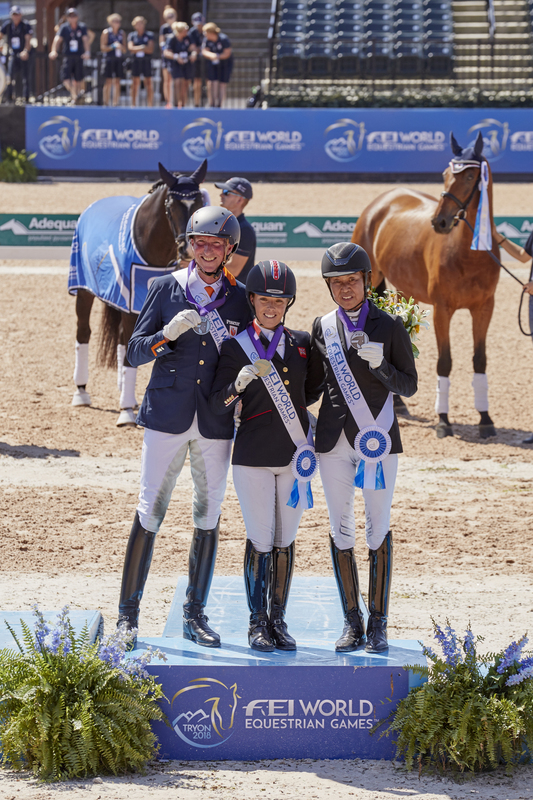 After an exciting 4 days of individual and team competitions, Para-dressage competition wrapped up on this day with the Freestyle portion of the FEI World Equestrian Games™ Tryon 2018 (Tryon International Equestrian Center (TIEC)). The freestyle is a test which is ridden to music. Riders create an original test which arrange compulsory movements within a set amount of time. Judging is based on how the combination performs on the technical level of the compulsory movements along with the artistic marks which contain the following: (Rhythm, energy, elasticity)(Harmony) (Riding Skills)(Choreography) (Music and interpretation of music). Tomoko Nakamura &D JazzF (10y./G/KWPN) were the 2nd to go in Grade V, the second competition of the day. The combination started dancing to an instrumental version of “Can’t Take My Eyes off of You”(Frankie Valli). Then went on to a rhythmical half pass to the music of Abba’s “Dancing Queen”, followed by an energetic canter sequence. The combination wrapped up their test with minimal mistakes and achieved an average score for technical of 72.40%, and an average score for artistic of 74.68%, resulting in a combined score of 73.540%. The next combination to go,Estelle Guillet&Magic Des Meuyrattes（9y./ G / CH ）scored 65.600 % but did not surpass Nakamura. Still with Nakamura& DJazz F on top, Sophie Wells&C Fatal Attraction(Individual Gold medal) performed 4th. Dancing to an original number by Tom Hunt（https://www.tomhuntmusic.com/) and including some higher technical movements, the combination scored 80.755%. Including a 10 from the German E judge for Music and interpretation of music, they showed a performance that showed the strengths of a champion both technically and artistically. At this point, 3 combinations remained. The next up were the Belgian combination (Individual 4th place) Ciska Vermeulen ＆ Rohmeo （16y. / G）. They scored 71.045％, which still kept Nakamura within the medals. Next was Frank Hosmar &Alphaville N.O.P.(13y. / G / KWPN)(Individual Silver medal) from the Netherlands. 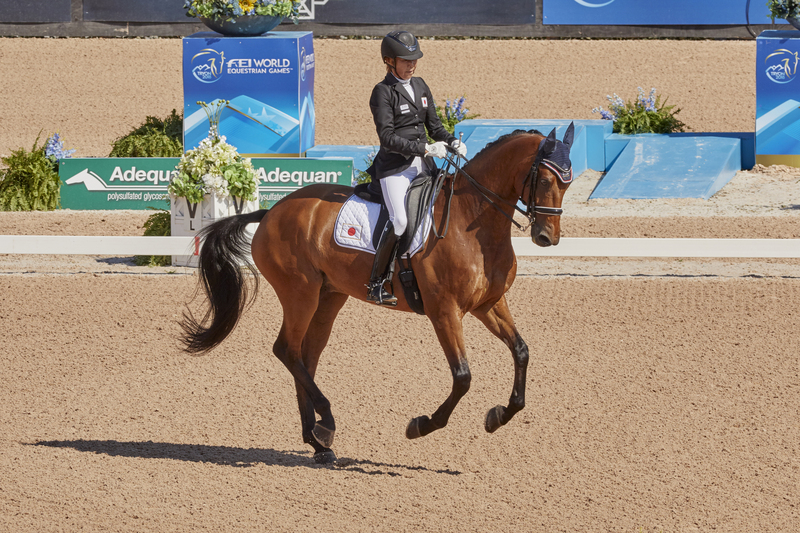 Where most combinations started their ride at the trot, Hosmar chose to start with the energetic canter movements. Performing high level half passes and simple changes on the music, Hosmar & Alphaville finished strongly. As the stadium awaited the scores, they were announced, with a result of 79.155％, just behind the top score and falling into silver medal position. This put Nakamura in 3rd place, and it was left to the last combination to determine the bronze medal winner. The last performance for the Grade V group was by the German combination, Regine Mispelkamp &Look At Me Now (12y./G) (Individual Bronze). Making a strong entry to the lyrics including the horse’s name , “Take a look at me now” from the Phil Collins’ song, the combination captured the audience. As they continued, they danced to a remix of Ed Sheeran and Pink songs. Looking at the average scores of the technical portions, Nakamura was ahead on 10 out o f 16. For the overall scores, Regina’s musical interpretation scores were higher, but for the rest Nakamura was on top. As a result, with 4 out of 5 judges putting Nakamura ahead, her overall score was higher than Regina’s 72.960 %. At this time, Nakamura became the bronze medalist. 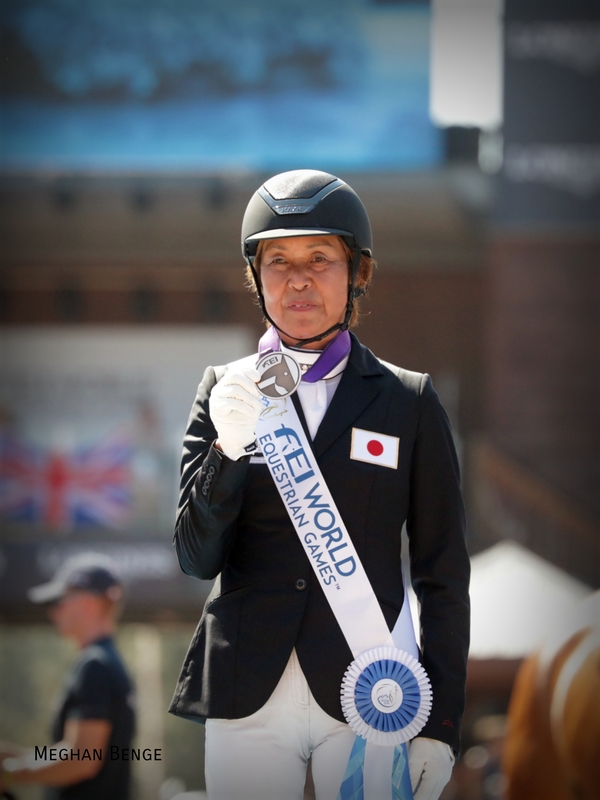 This was a great achievement, knowing that Nakamura, who was a dressage rider prior, had suffered a fracture in July 2016 and worked hard in rehabilitation programs to ride again. This bronze medal was the first and long awaited medal for Japan through both the Paralympics and World Championships. A delightful step forward towards 2020 when Tokyo will host the next Paralympic games. 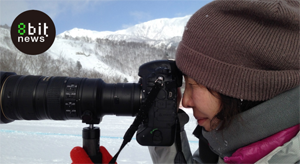 Nakamura will keep going upon her return to Japan. She will be competing as a part of the Nara prefecture equestrian team at the National Athletics Meet on October 2. 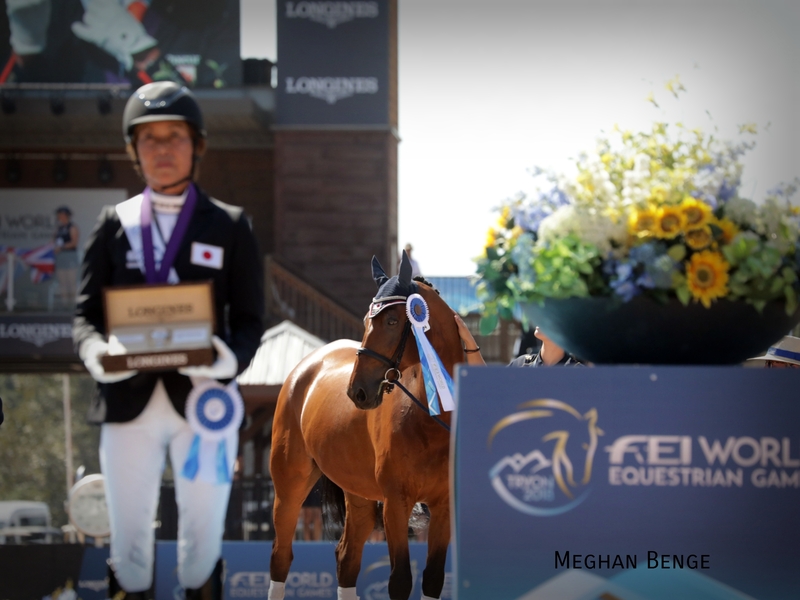 She will try to defend her title from last year in Ehime where she made her come back to horse sport and became champion. There is a lot ahead for Nakamura to come, aiming to be a part of the 2020 team. The 73rd National Athletics Meet/Fukui Shiawase Genki Kokutai 2018 (Gotemba Sports Center). Women’s Dressage will be held from 9AM on 10/2 (Tues). Nakamura & Pacific B will be performing last.